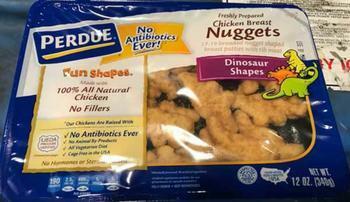 Perdue Foods of Bridgewater, Va., is recalling approximately 16,011 pounds of ready-to-eat chicken nuggets. The product contains milk, an allergen not declared on the label. The recalled product, bearing establishment number “P-369” inside the USDA mark of inspection, was shipped to retail locations in Connecticut, Delaware, Washington, DC, Maine, Maryland, Massachusetts, New Jersey, New York, Ohio, Pennsylvania, Rhode Island, Vermont, Virginia and West Virginia. Consumers who purchased the recalled product should not consume it, but discard it or returned it the place of purchase. Consumers with questions regarding the recall may contact Perdue consumer care at (866) 866-3703.